World Champion Mathieu Barbarit and Caroline Angibaud from France are looking to see if there would be anyone interested in a one day waveski clinic centered around the US Championships in Sebastian Inlet. The clinic would cover everything from stretching to advanced maneuvers to reading the waves. Mathieu and Caroline have given their clinic all over the world. The cost of the one day clinic would be $125.00. Post a reply here or email me at roy@waveski.com if you are interested and I will let them know. The U.S Wave Ski Nationals start in one month down in Florida and the Wave Ski Worlds start in two weeks time in Australia. Both events are expected to draw a dedicated breed of paddle surfers showcasing the sport to the extreme. SC&K will be manning a booth in Florida for the Nationals. 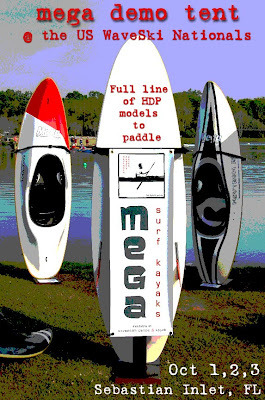 Come on down and check out this exciting sport, try a Mega Surf Kayak or just hang out at the beach. 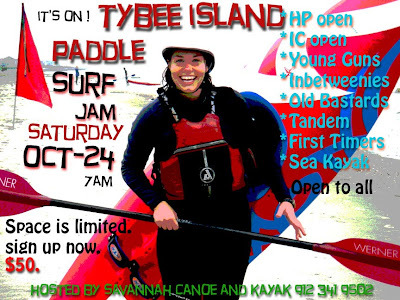 After a great weekend of surf along the east coast, and by popular demand, the Tybee Paddle Surf Jam is back on. This event is aimed squarely at the fun side of competition surfing, and especially those new to paddle surfing. We hope to see lots of newcomers taking part in their first ever surfing event and we will be giving out some cool prizes for this category. 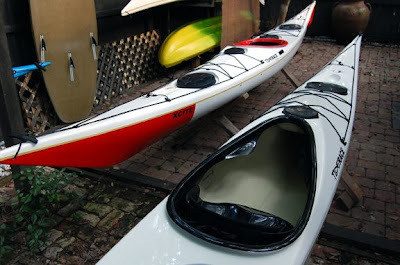 For the Tandem category we will supply the kayaks. Each entrant can sign up for up to 4 categories. Sea Kayaks are anything over 15ft. Call in to sign up now. Somewhere down there, bobbing on the big blue ocean, under ominous Sky's, are little boats with nowhere to hide. Spare a thought and save them a prayer. 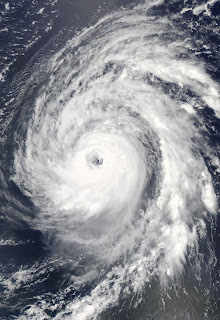 Large swells from Bill will begin impacting the U.S. East coast from Florida to Maine beginning Friday night or Saturday morning. Seas will build to 5 - 10 feet in the offshore waters from central Florida northwards to South Carolina, and to 10 - 15 feet from North Carolina to Cape Cod. Near shore, waves will be about 40% less. This will cause a significant coastal erosion event along some portions of the coast. The latest run of the NOAA Wavewatch III model suggests that significant wave heights near Bill's center will reach 50 feet on Sunday. Since maximum wave height is typically about a factor of 1.9 greater than the significant wave height (which is the average trough-to-crest height of the top 1/3 largest waves), a few huge waves near Bill's center may reach 95 feet high. I'm not sure where Nick came from, but he has been a great addition to the SC&K team over the last few years. There are no boats that Nick does not look completely at home in.. whether it be whitewater, wave ski, sprint boat, or sea kayak. He is a paddler through and through. As a guide and instructor, he knows when to talk, when to shut up, and has a good mix of humour and seriousness. His knowledge of the marine environment makes him an asset to this community. In September Nick is moving to Sapelo Island. He will be working through UGA where, we are glad to say, he will continue his involvement with the study and research of the GA Coast. 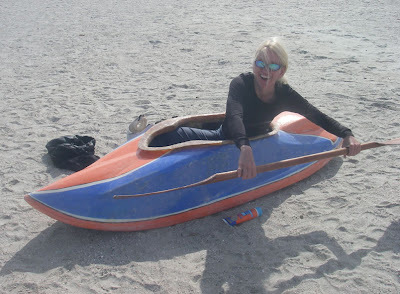 So, it was completely in character earlier this year when Nick made a surf kayak that just would not roll. Is there a kayak out there that does not roll? Yes... and Nick Scoville built it. The only time you will see Nick swimming with a paddle in his hand is when he takes out 'The Moose'. "It does everything else pretty well." said the ever optimistic Mr Scoville. Above. Kristin checks out the Moose. Notice the matching sunscreen tube...cool. 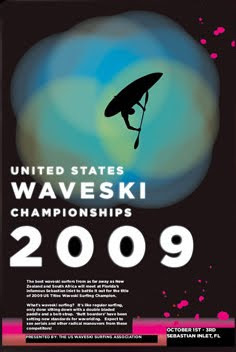 This is the a competition to find the US Wave ski Champion . It's going to be a super fun event and probably one of the biggest ever on the East Coast at a prime surf spot that is nearly impossible to surf for paddle surfers.. 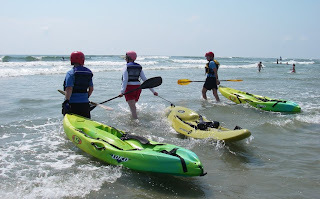 There is a 'surf kayak' category as well as wave ski. We will be hosting the Mega tent with the full line of plastic demos as well as one or two composites..and some hot prize give aways.. The full range of Tiderace sea kayaks will be available to test paddle including the Xplore X. There will be two types of demo paddles available. Both are guided, but one is on flat water to Little Tybee the other will be through the triangle. The paddles will be at 9am, 11am, 2pm and 4pm on both days with 5 places available on each. Call to reserve you free place on a Tiderace test paddle. 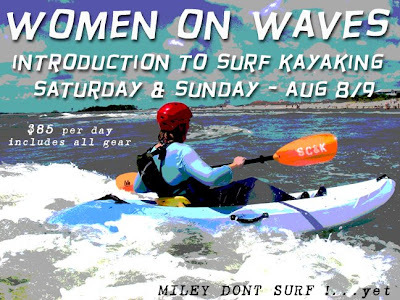 Women on Waves - End of Prt 1. Awesome waves yet again on Tybee today made for a great start to our all women's surf class this weekend. Light onshore breezes and a nice little ground swell gave the ladies 2-3 ft and glassy conditions, ideal for surf skills progression. After working out our strokes on a flat water session, we transferred to the front side and got to grips with edging, trimming and steering. The surf zone was a medley of surfers and swimmers, but the gals kept their reins tight and no collisions were reported. Wave selection, moving into position and cutting back. Well done women on waves. A Good Positive Attitude = A Confident Paddler = A Competent Paddler. 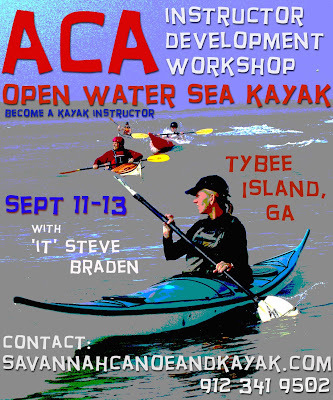 Become a Sea or Surf Kayak Instructor ! We have two exciting Instructor training programs coming up. 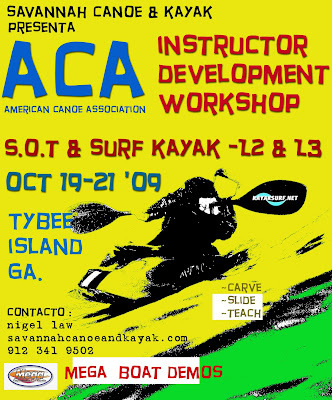 If you are thinking about increasing your paddle knowledge, or have aspirations to become an instructor in either surf kayaking or sea kayaking, now is the time to sign up. 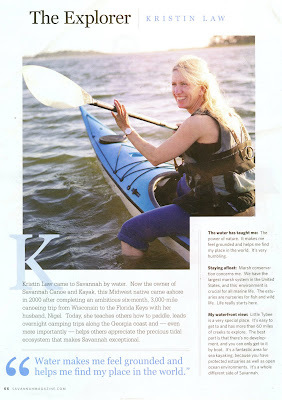 - Savannah Magazine featured 14 of Savannah's 'on water' personalities and our very own Kristin Law was one of them. Also featured was Jason Buelterman, Mayor of Tybee and local shrimper Micheal Sullivan. 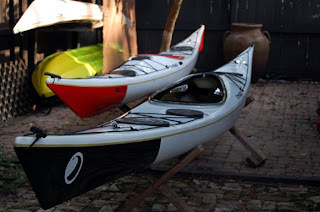 After prolonged bouts of Omming and Arghing, our first batch of Tiderace Sea Kayaks are now sitting pretty at Savannah Canoe and Kayak. "It was a 1600 mile boat pick-up unlike any other. Our window of opportunity was a narrow one, as we were looking for a quick turn around. We left Savannah at 10am Saturday and arrived in downtown Manhattan at 2pm that night. It was going off. High heels and mini skirts were the dress code for the Bladerunneresque scene we drove into. Torrential rain on Sunday put our loading schedule back a day, but also allowed time for some free kayaking on the Hudson River along with some used book store browsing in 'The Village'. By 10.30 Monday morning we were cruising along the Jersey Turnpike with 24 G's of hot Yak heading for the south." Thanks to all our Tiderace customers for their well wishes as the trip was, for the most part, karma free. 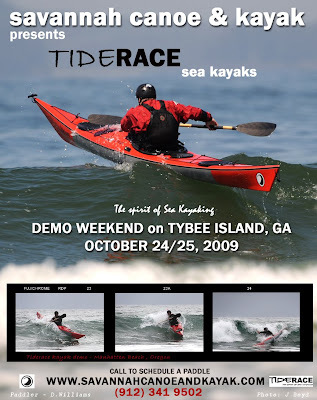 This addition of the Tiderace line now gives SC+K the finest selection of 'in-stock' surfing kayaks in the USA. Call to schedule a Tiderace or Mega demo, or just come over and 'have a seat'. 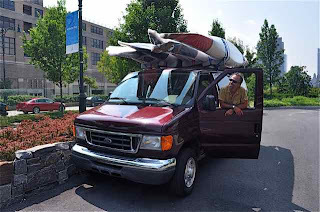 A van full of kayaks...going south.